Teenage off-spinner returned 4/43 to stop Windies at 204 before opening batsman hit 93-ball 84 to complete seven-wicket victory. It’s not how you start but how you finish – Afghanistan proved the old maxim right as they clinched the ICC Cricket World Cup Qualifier 2018 title at a canter, beating Windies by seven wickets at Harare Sports Club. That completed a fairytale comeback for the team, who had started the competition with three successive losses before running up a sequence of five wins to take home the trophy. Both teams had already qualified for the ICC Cricket World Cup 2019, which was the main objective, but there were still bragging rights and silverware on offer. Mujeeb Ur Rahman first led the way with 4/43 to the bowl out Windies for 204 in 46.5 overs. Mohammad Shahzad, in his usual flamboyant style, then cracked a 93-ball 84 as Afghanistan reached 206/3 in just 40.4 overs, Mohammad Nabi finishing the job with three sixes in a row off Chris Gayle. However, Keemo Paul soon brought Windies back in the game by getting Naib to edge one straight into the hands of Gayle stationed at first slip to depart for 14. Rahmat Shah joined Shahzad in the middle and the two ensured they did not let the advantage slip. Shahzad carried on with his belligerent strokeplay, holding his pose for the benefit of the cameras on many occasions, to reach his 13th one-day international half-century with a clip down to fine-leg. A jig followed to commemorate the feat, leaving players from both sides in splits. Shah quickly found his feet too as runs started to flow from both ends. Jason Holder then introduced Gayle into the attack and the occasional off-spinner did the job for his captain immediately. Floating the ball well above the batsman's eyeline, Gayle induced a false shot from Shahzad to end the 90-run second-wicket partnership. Shahzad’s innings was laced with 11 fours and two sixes. Shah continued his rich vein of form, getting to his 11th ODI half-century before Gayle struck again to send him back for a 78-ball 51. 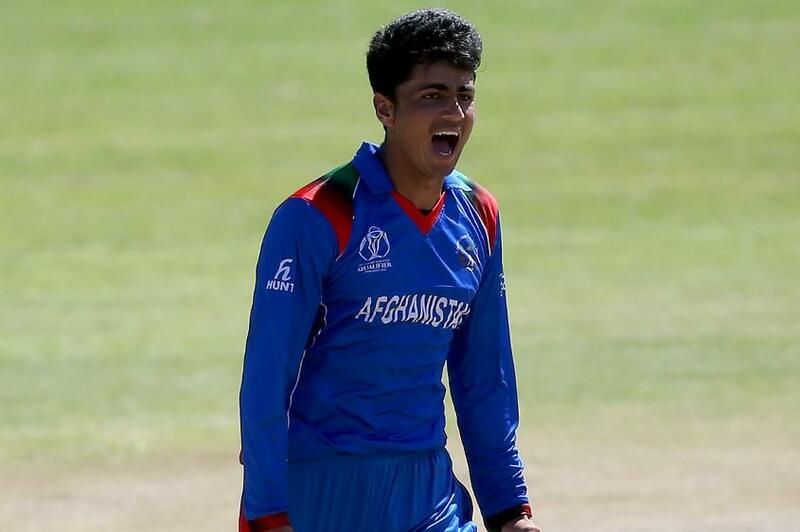 But the damage had more or less been done by then, with Afghanistan having reached 170/3 in 36.2 overs, and experienced hands Samiullah Shenwari (20*) and Nabi (27*) finished off the chase to spark wild celebrations in the Afghanistan camp. Earlier, after opting to bat, Windies lost wickets regularly as Mujeeb ran riot. The 16-year-old off-spinner once again accounted for Gayle. Having batted patiently for 18 deliveries, Gayle (10) looked to clip Mujeeb through the on-side but was undone by a googly. He ended up popping a leading edge to cover, where Sharafuddin Ashraf completed an excellent catch running back. Evin Lewis, who had restrained himself till that point, then opened up, first carting Dawlat Zadran over mid-off for four, and then hitting Mujeeb for three more boundaries. Shai Hope started strong as well, slapping a monstrous six over long-on, as Windies reached the 50-mark in the 11th over. Just as the partnership started to flourish, Naib struck to remove Lewis for a 36-ball 37. The Windies opener attempted an expansive loft over the covers, but ended up providing Shahzad a simple catch behind the stumps. Windies were reduced to 50/2 in 12 overs as a result. Marlon Samuels (17) got a decent start as well, smashing Naib for a four and six, but the right-arm seamer got his revenge in his very next over, deceiving the Windies No.4 with a slower delivery. Samuels could only hit it to Shah at short mid-wicket. Rashid Khan then came into the attack, and it did not take him long to strike, trapping Hope in front of the stumps for 23 with a googly. It was his 100th wicket in just his 44th ODI, and in doing so, he became the quickest to reach the landmark in the format, overtaking the record set by Mitchell Starc. Windies were four down with less than 100 runs on board, and their troubles deepened when Holder, the captain, was run out without facing a delivery, leaving his side on a precarious 101/5 in the 24th over. Shimron Hetmyer fell for a 51-ball 38, while Brathwaite (14) was snared by Dawlat. However, Rovman Powell (44) and Ashley Nurse (26*) added a crucial 41 for the eighth wicket, taking the score past the 200-run mark before Mujeeb struck thrice in an over to finish the innings off. Shahzad, who marked an excellent return to form with successive half-centuries – he had scored 54 in the previous game against Ireland – was named the Player of the Match.